“Gourmet” burgers are all the rage right now in restaurants. It’s sort of odd when you think about it. Hamburgers are about as ubiquitous a food as you can get. Perhaps one rivals it – pizza. You still need to see chunks of cheese. And it’s not only what’s on top that differs from what we were used to when we were young. The inside has fallen victim as well. How about burgers stuffed with curry chicken, wild mushrooms or steak and swiss cheese? 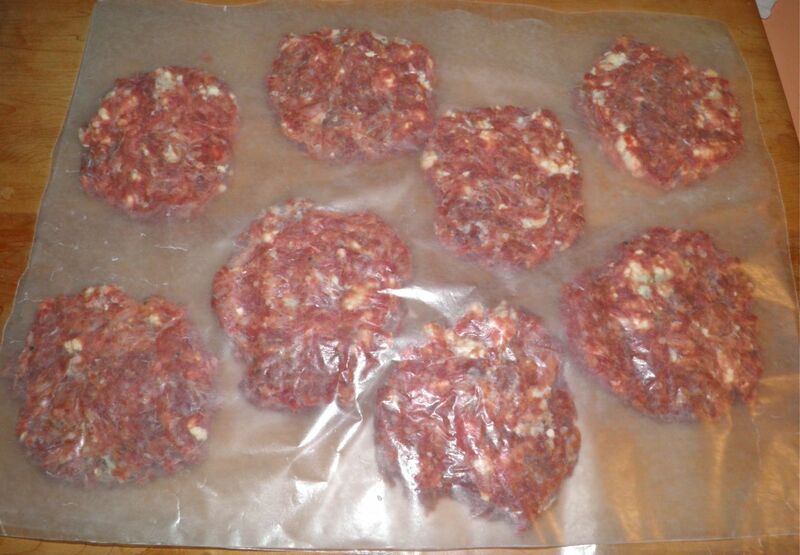 Of course there’s just *plain* cheese stuffed burgers (sort of an inside out cheeseburger), but I’ve always thought of them as slightly dangerous. Who appreciates searing hot melted cheese running down their chin? There is an alternative that gives you the cheese, but not in one molten lump. 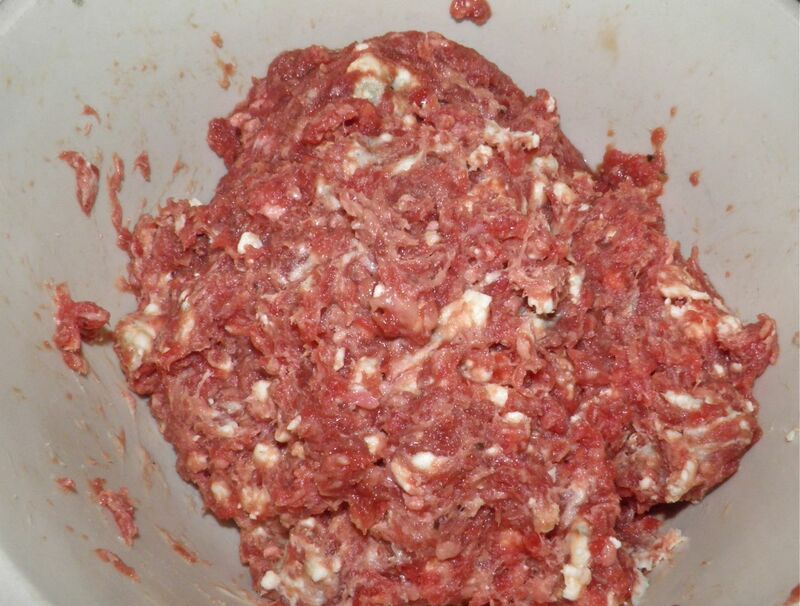 Crumble or dice cheese and mix it in with the meat. This technique gives the entire burger a delicious cheesy flavour. To top it off, the cheese in recipe is blue cheese. When I’m serving blue cheese with grapes I opt for a soft and flavourful cheese, like cambozola. That’s a style of cheese that has camembert combined with gorgonzola. It's delicious. I would suggest you don’t go that route with these burgers. Choose a blue cheese that is fairly firm – not creamy. A creamy cheese will just leak out of your burgers and disappear when fried or grilled. Step 1 of shaping. Arrange on waxed paper. That’s why I chose roquefort. It’s affordable (as cheese goes…) and maintains chunks when broken up. Surprisingly, basil pairs wonderfully with the blue cheese. My best way to introduce it? A basil mayonnaise (just basil chopped up in mayonnaise). To form the patties I went back to my days making burgers at the Firemans’ Canteen in my home village. To keep the mess to a minimum, divide the meat into balls and arrange on waxed paper. Top with another sheet and flatten with your hand. The waxed paper makes transportation – or freezing individually – a breeze. 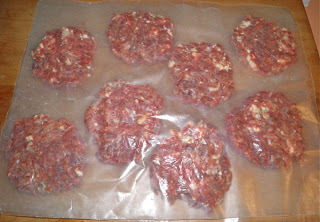 Burgers with “additions” in the meat should be chilled for a while. This helps the meat gain some stability so they have less chance of breaking up when cooking. If you’re in the mood to throw a curve to your friends at your next backyard fête, try these burgers. I’m sure you’ll be asked for the recipe. with your hand. They're allowed to be freeform. Make the basil mayonnaise first. Chop the leaves coarsely and place in a blender with the mayonnaise. Pulse until the basil is very small. Remove to a small dish. 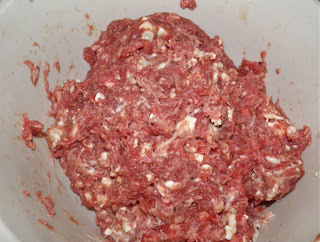 Mix the beef, egg, mustard powder, hot sauce, Worcestershire, salt and pepper together in a bowl. Use your hands. Crumble the roquefort on top and mix again until just mixed through. You still want visible pieces of cheese. 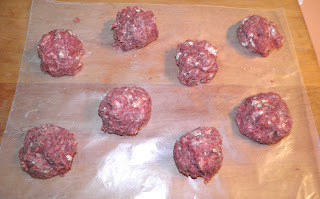 Fry the burgers in a non-stick pan (if possible) on both sides until browned and the juices run clear. Some of the cheese will be oozing out. 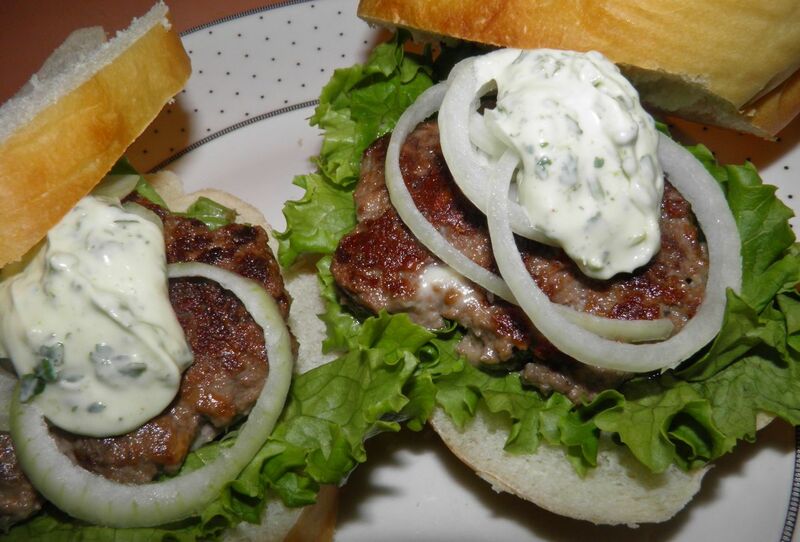 To serve, place some lettuce on the bottom bread (or bun), place 1 patty on top, and add onions and basil mayo to taste.